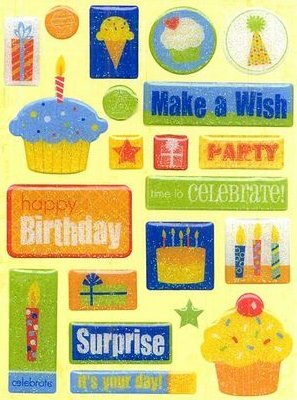 Happy Birthday, Make A Wish, It's Your Day and Celebrate are among the phrases featured on this sheet of birthday stickers. Also featured are birthday cakes, cupcakes, ice-cream, presents, candles and a party hat. Each sticker is an epoxy sticker embellished with glitter to add some festive cheer. They are perfect for your birthday scrapbooking layouts, cards and gifts. Size 4 1/2" x 6"